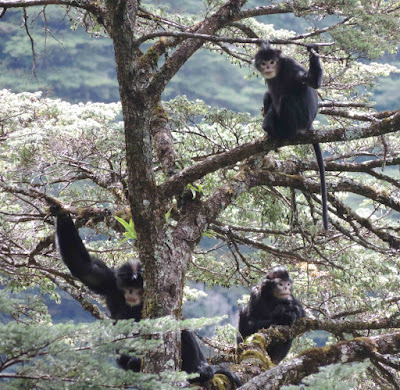 Family of Rhinopithecus strykeri in Luoma, China, near the border with Myanmar. 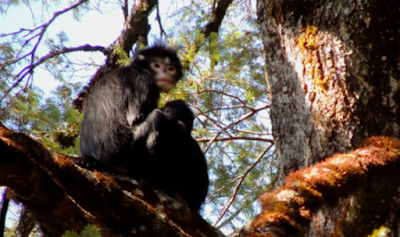 The Myanmar snub-nosed monkey Rhinopithecus strykeri was discovered in 2010 on the western slopes of the Gaoligong Mountains in the Irrawaddy River basin in Myanmar and subsequently in the same river basin in China, in 2011. 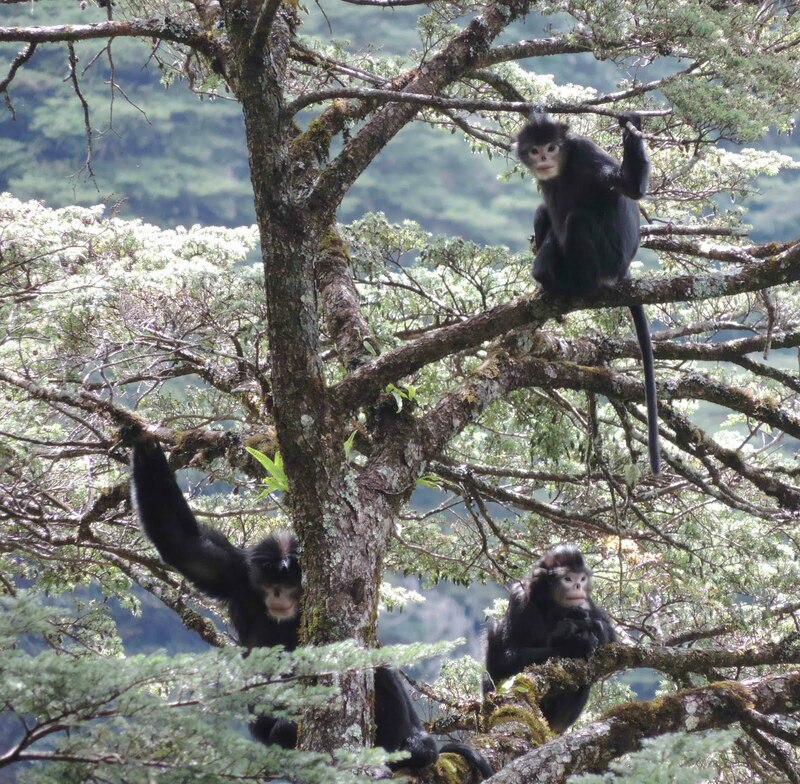 Based on 2 years of surveying the remote and little disturbed forest of the Gaoligong Mountains National Nature Reserve in China, with outline transect sampling and infrared camera monitoring, a breeding group comprising > 70 individuals was found on the eastern slopes of the Gaoligong Mountains in the Salween River Basin. Given the Critically Endangered status of this primate (a total of < 950 individuals are estimated to remain in the wild), efforts to protect the relatively undisturbed habitat of this newly discovered population and to prevent hunting are essential for the long-term survival of this species. Rhinopithecus strykeri in the newly discovered population in Luoma, China, near the border with Myanmar. Mother and infant of Rhinopithecus strykeri in the newly discovered population in Luoma, China, near the border with Myanmar. Yin Yang, Ying-Ping Tian, Chen-Xiang He, Zhipang Huang, Shao-Hua Dong, Bin Wang, Guang-Song Li, Zuo-Fu Xiang, Yong-Cheng Long and Wen Xiao. 2016. 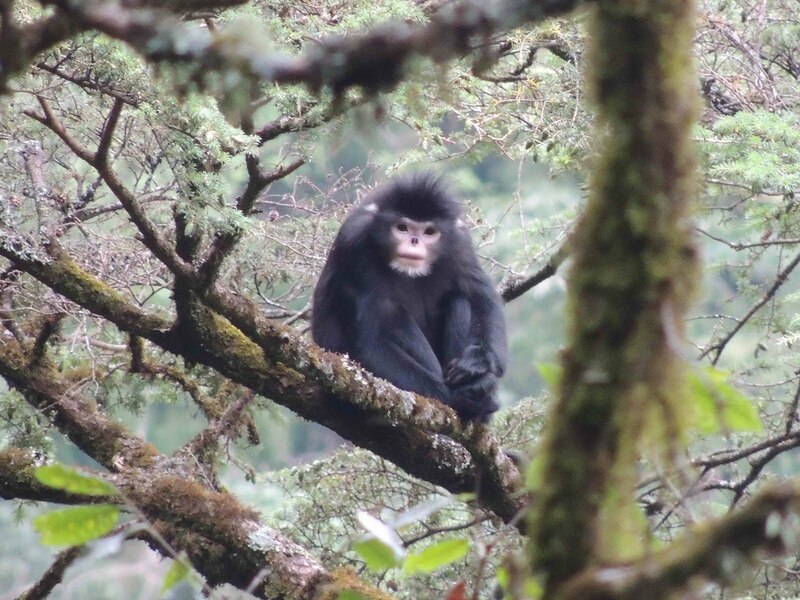 The Critically Endangered Myanmar Snub-nosed Monkey Rhinopithecus strykeri found in the Salween River Basin, China.